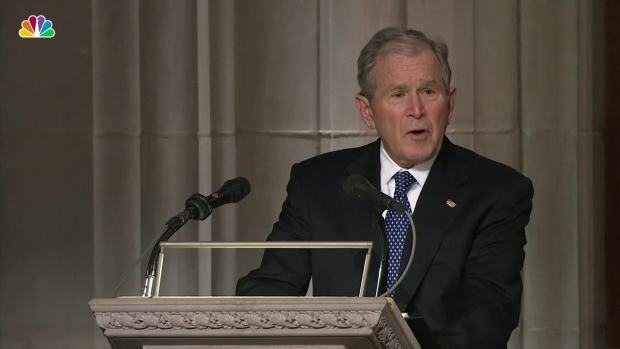 George W. Bush said of his father: "Your decency, sincerity and kind soul will stay with us forever." 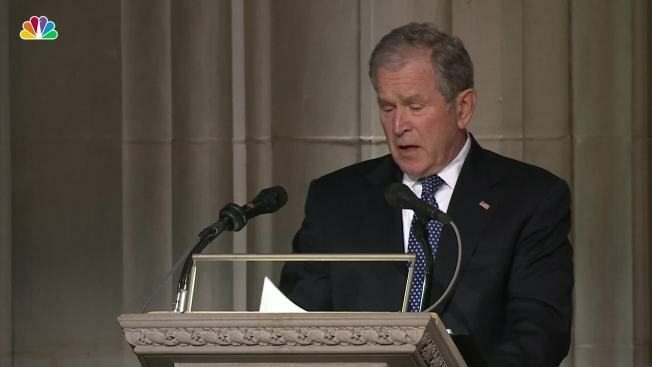 The national funeral service capped 3 days of remembrance in Washington before Bush's remains returned to Texas. President Donald Trump ordered the federal government closed Wednesday for a national day of mourning. The nation bid goodbye to George H.W. 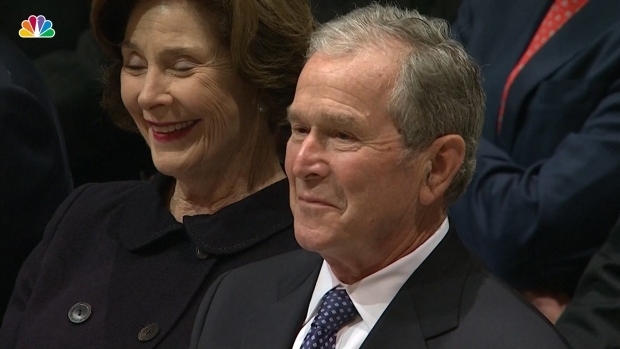 Bush with high praise, cannon salutes and gentle humor Wednesday, celebrating the life of the Texan who embraced a lifetime of service in Washington and was the last president to fight for the U.S. in wartime. 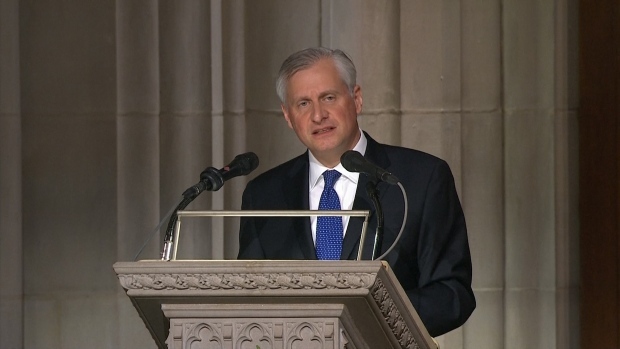 Three former presidents looked on at Washington National Cathedral as a fourth — George W. Bush — eulogized his dad as "the brightest of a thousand points of light." George W. Bush jokes about his father's hatred of broccoli, lack of dance skills and his golf game. Presidential historian Jon Meacham remembers when, on the campaign trail, former President George H.W. Bush had an interaction with a mannequin. 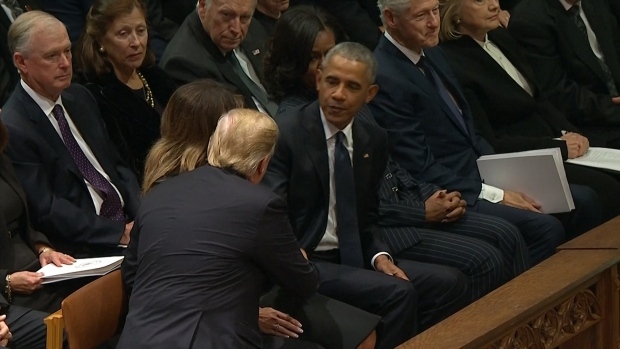 President Donald Trump and first lady Melania Trump shook hands with former President Barack Obama and former first lady Michelle Obama after the Trumps arrived at George H.W. Bush’s funeral at the National Cathedral. While paying his respects to former President George H.W. 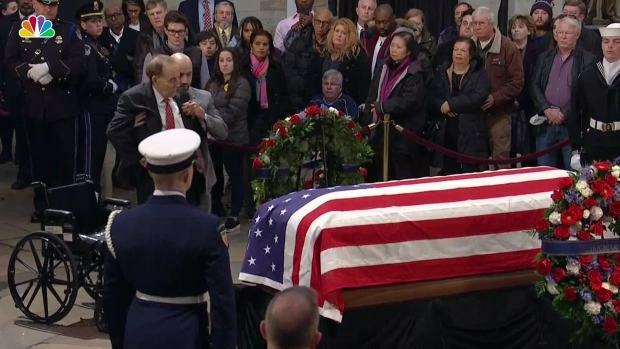 Bush at the Capitol, former Sen. Bob Dole is helped out of his wheelchair to salute the casket of the former president.